WEST WINDSOR – Princeton resident Greg Olsen, entrepreneur, scientist, and the third private citizen to orbit the Earth on the International Space Station (ISS), will present the lecture "From Entrepreneurship to Spaceship" at Mercer County Community College (MCCC) at noon on Wednesday, March 26. Olsen’s presentation, part of MCCC’s Distinguished Lecture Series, will be held in Room 107 of the Communications Building on the college’s West Windsor Campus, 1200 Old Trenton Road. The lecture is free and open to the public. Olsen will discuss his experiences starting and selling two startup businesses, as well as his voyage on the ISS and the different experiments he was involved in while aboard the station. After training for five months at the Yuri Gagarin Cosmonaut Training Center in Moscow, Olsen launched on a Russian Soyuz rocket TMA-7 on Oct. 1, 2005 with Cosmonaut Valeri Tokarev and Astronaut Bill McArthur. The ship docked to the ISS on Oct. 3, and returned to earth on Oct. 11. 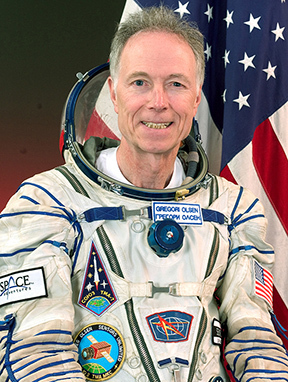 Olsen performed more than 150 orbits of the Earth and logged almost 4 million miles of weightless travel during his 10 days in space. Olsen was the founder of EPITAXX, a fiber-optic detector manufacturer, in 1984 with Vladimir Ban. It was sold in 1990 for $12 million. He then founded Sensors Unlimited, a near-infrared camera manufacturer, in 1992 with Marshall Cohen. Sensors was sold to Finisar Corp. for $600 million in 2000, repurchased by the management team in 2002 for $6 million, and sold again to Goodrich Corp. in 2005 for $60 million. Dr. Greg Olsen, president of GHO Ventures of Princeton and the third private citizen to orbit the Earth on the International Space Station, will present a lecture at MCCC March 26. Olsen received a bachelor’s degree in Physics, a bachelor’s of science in Electrical Engineering, and a master’s in Physics from Fairleigh Dickinson University. He was awarded a Ph.D. in Materials Science from the University of Virginia. Olsen has been the "Entrepreneur in Residence" at Princeton University since 2009. Olsen is now president of GHO Ventures in Princeton, where he manages his "angel" investments.